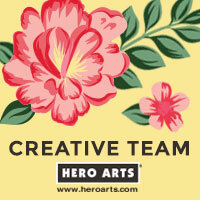 This week I've been busy over at the Hero Arts Blog sharing some amazing creations made by the girls on the Hero Arts Designer Team. The focus has been all about making your own embellishments and today I shared my project. I created some layered embellishments using handmade stamped buttons. I'm really starting to love button making...the possibilities are endless to the kinds of buttons you can make! And Halle, my 5 yr. old daughter, loves to sit down and make her own buttons right alongside me. I love that it is something we can do together. And if you want to see the set of cards I made using some of these embellishments, check them out here on the Hero Arts Blog. these turned out great--so inspiring! I may have to drag out my pasta machine and try some, too. have a great weekend, kelly! These are really beautiful, have never worked with clay before, do you have instructions on how to make the buttons, I may have missed that if you posted it elsewhere, so inspiring! beautiful! just love your embellishments, Kelly! it's so cute that your girl makes buttons with you! have a wonderful weekend!